A park on legs is how some describe it. The exceptional new pedestrian and cycle bridge in ʼs-Hertogenbosch that connects the historic city centre to the Paleiskwartier (Palace Quarter). This is a former warehouse district that now houses the court building, a number of universities of applied science and agriculture and a lot of new homes and offices. It is a garden bridge that was inspired by the Ponte Vecchio in Florence and the High Line in New York City. Initially the bridge would be called “Ponte Pallazzo” to indicate its Italian roots, but that was considered too fancy and over the top for a Dutch bridge. So a name giving contest was held and the winning name was… simply the Dutch translation: Paleisbrug (Palace bridge). The ‘Palace’ in that name relates to the high court that can be found in the area, which the Dutch refer to with the equivalent of ‘Palace of Justice’. 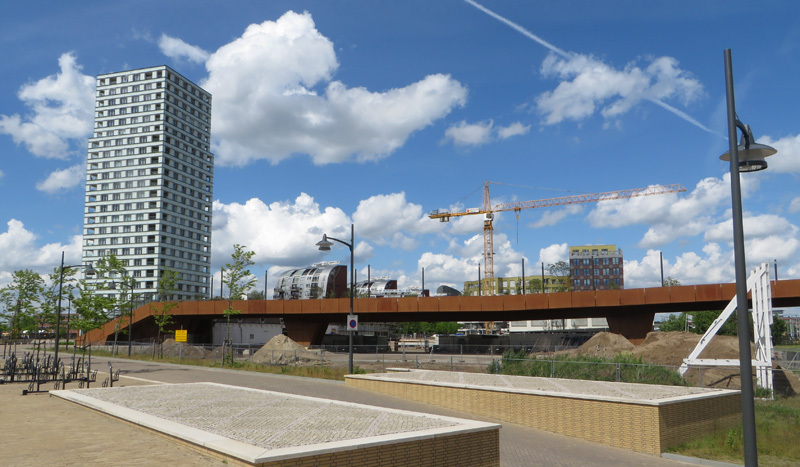 The new bridge of weathered steel in the re-developed area right behind the central station in ʼs-Hertogenbosch. The bridge across the railway line running from ʼs-Hertogenbosch further south had to be 250 metres long. Any bridge that long has the risk of becoming an unpleasant place. That is why the architects decided to make the bridge a ‘place’. They wanted the 10 metre wide bridge to become a destination in itself, an inviting place where people would go for a stroll and where they would sit to relax. That’s probably also why this garden bridge now even has free wifi. This aerial picture gives a good idea of the scale of the bridge. Top left the historic city centre of ʼs-Hertogenbosch that is oddly enough situated at the edge of the city. That is why at the top right and right of the picture you can already see the countryside. Also visible is the underpass (just right of the trains) that is the original cycle route that requires only a very short detour. Picture by Jannes Linders. The plants, shrubs and trees (there are 32 big boxes for full size trees integrated in this bridge) are what makes this bridge very special. 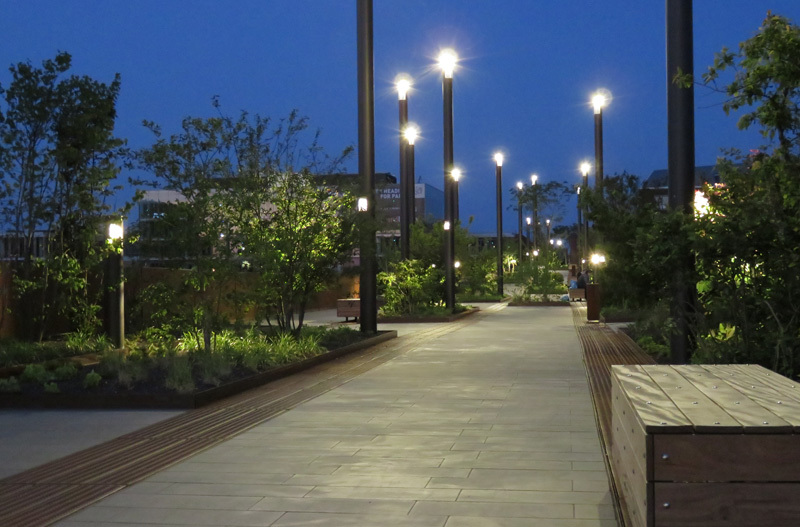 The features of the bridge, its benches and these plants and trees are beautifully illuminated. This makes the bridge a very pleasant place to be, also at night. Where all the different plant areas would fit best was determined in a collaboration between the leading architect Mels Crouwel and the garden designer Piet Oudolf, who designed the planting scheme for the bridge. He was also involved in the planting design of the New York High line and The Gardens of Remembrance for the victims of the 9/11 attack. There are different planting schemes for different areas of the bridge and the plants, shrubs and trees were selected on different flowering periods, this will make the bridge special all year round. The bridge is beautifully illuminated at night. The lamp posts have room for surveillance cameras, should these be needed in future. The bridge has state of the art technology. 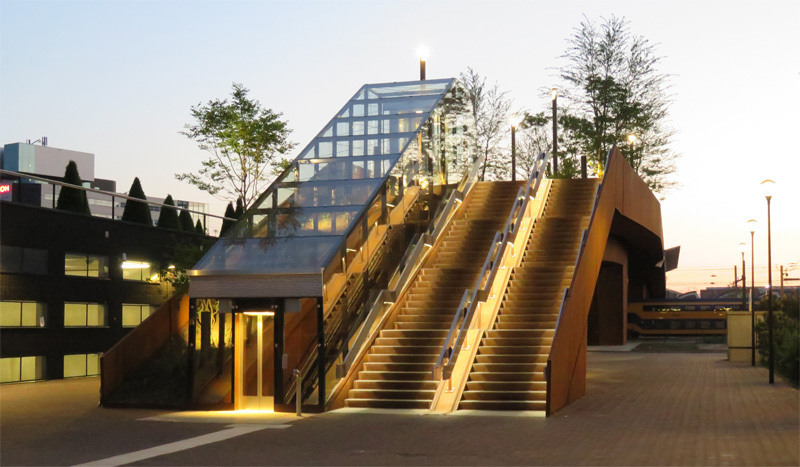 Not only does it have a drainage and irrigation system, a solar thermal heating system was also installed to keep the bridge deck and stairs at a minimum temperature of 10 degrees Celsius in winter. This prevents the bridge from freezing without the need to spread salt, which would affect both the steel of the bridge as well as the plants. Even the drainage and irrigation system are heated by the thermal system, so there will also be no problems with rain water freezing in the drainage pipes. Because of the thermal heating system the bridge can also be used as a massive solar collector during summer. Another technical achievement was the design of the inclined lifts at either end of the bridge. There aren’t many inclined outdoor elevators yet, but the designers could learn from the experiences with the inclined lift of the Millennium Bridge in London. There too the doors were a particular concern as the lift arrangement has entrances on opposing sides of the car. The coupling of the doors is complex and needs to be tolerant to minor variations in the car position due to load in the car or weather conditions. But these problems were overcome and the lifts work nicely. The entrance from the city centre side at dusk. The stairs have channels to access the bridge with a bicycle. The inclined lift offers an even easier access. The elevator is large enough for several bicycles and I have the feeling a velomobile would also fit. The trees and shrubs on the bridge are clearly visible from the street level. The opening of the bridge got a lot of positive attention, also abroad, but in the city of ʼs-Hertogenbosch the bridge caused a lot of criticism. Especially the price tag of 17.6 million Euro was thought too high by many. That there was a delay in the building time of almost two years didn’t help to get people enthusiastic either. Right at the beginning of the building process, it turned out that the main bridge parts over the railway line were not strong enough. Who had to pay to get this right had to be settled in court. The court case dragged for a long time, causing that delay. In the end the court decided that not the city but ProRail had to cover the costs of the reinforcements. People who are in favour of the garden bridge emphasise that ʼs-Hertogenbosch got a unique elevated park of 2,500sqm in size, worth every Euro the city had pay for it. The construction of the bridge took a lot longer than expected due to problems with some bridge parts that were not strong enough. The supporting columns can be seen here. Their core is normal concrete that was later clad in weathered steel. Although it is meant to be a bridge for walking and cycling, it feels more like a pedestrian bridge to me than a real cycle bridge. Mainly because there is no designated area for cycling on the bridge itself and you need to use the stairs or the elevators to get onto the 6 metre high bridge with your bicycle. The stairs do have a channel that you can use to roll your bicycle up, but the elevators are much more convenient. Many people can be seen pushing their bicycle across, most likely because there is no cycleway on the bridge. The Dutch are not really used to a shared space for walking and cycling and they may feel they would be cycling in pedestrian space, which is normally forbidden in this country. The fact that you have to zigzag between the plant beds on the bridge is also not helpful. But now that it has been in use for some time, I was surprised by the number of people who do use this bridge with their bicycle (riding or pushing it). There is an alternative route with proper cycling infrastructure (that is a longer distance but would require about the same time), but that route is not as pleasant as this bridge is. That is probably why so many people prefer this short-cut through the elevated park, even though that requires a bit of extra time to get through, because of the elevators or stairs and the shared space. It only shows that infrastructure also has to be inviting to use. And that is definitely what this bridge has become: an inviting place to be. who did build the inclined lifts ? As you say a worthy attempt, but seems designed to discourage cyclists with the lifts /stairs and planting boxes staggered in an obviously obstructive ‘slalom’ layout. Though for pedestrians its near perfect for a lunchtime picnic, all it needs are deckchairs :). Escalators with sensors would be better for people on foot or bikes, elevators are necessary for disabled as no wheelchairs friendly ramps have been provided. Bit like the ‘curates eggs’, good in parts, wish for better, heh? Just gorgeous! Would that America could take note and apply such an approach to public places more frequently! A minus I find of this bridge is that it doesn’t look nice from the outside. When I ride under it on the train, a rust-brown coloured structure does not look very inviting. Why is Dutch design of parks and public spaces 100x better than American design? Seriously! Are the entry points to the bridge in parks? At both ends? No, the western end (Paleiskwartier) might be considered so, it is in an area still in development, but there is for example a considerable artificial pool nearby, but the eastern end (city) is purely an office/residential area. I can’t see how this would be considered a cycling bridge, or part of a cycling infrastructure. Could you shed some more light on the alternative routes? How long a detour would be required? Does the city really think this is a part of their infrastructure, which could lead to the alternatives being downgraded? If so, that sounds like a very bad idea. For the eldery or bakfietsmoeders this likely wouldn’t work at all, and even for normal bikes I expect the volume that can be safely handled to be very low? Although it is called a cycle bridge it really isn’t, I agree. But you needed worry about the alternative. I have added a map with the alternative route. It is a perfect red asphalt connection that has very recently been upgraded. It willl certainly not be removed or downgraded. That is the route that will be used by most people cycling from A to B as they have always done. This bridge is much more a short-cut for pedestrians and a destination in itself. That said: more people than I expected chose to take the bridge with their bicycle after all. Simply because it is so beautiful and they prefer it over the route alongside of motortraffic. You think people really prefer the new route, or might the initial usage be explained by curiosity? You’ll have to check out the new infrastructure at least once or twice before deciding whether it’s an improvement. You might see the number of cyclists drop in a few months. Ik woon in het paleiskwartier. 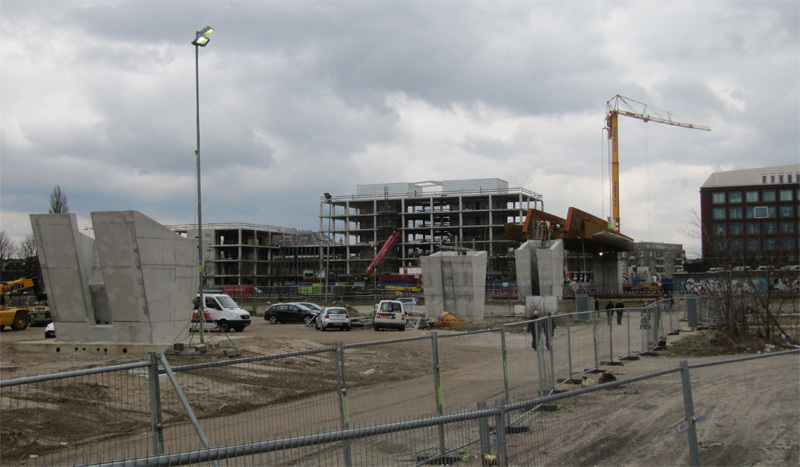 Ik wou zeggen het Paleisbrug is heel handig voor de inwoners die daar wonen en het is korte weg om naar het centrum te gaan. als ik boodschappen in het centrum ga doen, hoef ik nu niet meer om lopen of fietsen onder spoorbrug die naast Essent staat. Ik nam vroeger altijd de brug via central station en het is altijd druk. Het spijt me dat mijn Nederlands niet perfect is. Ik ben buitenlander die in Nederland woon, werken en studeren. Ik hou van fietsen en wandelen zoals de meeste Nederlanders. If you are not convinced that this is a good cycle route I agree. If this was the only connection it would not be enough. But as I said in the post there is a perfect alternative cycle route on separated cycling infrastructure. This is simply an extra route to make it very easy and pleasant to get to the new area from the old city. You need safe and adequate connections in a city, but once you have those, you also need nice places. And in that respect this is a very convincing nice place in my opinion. 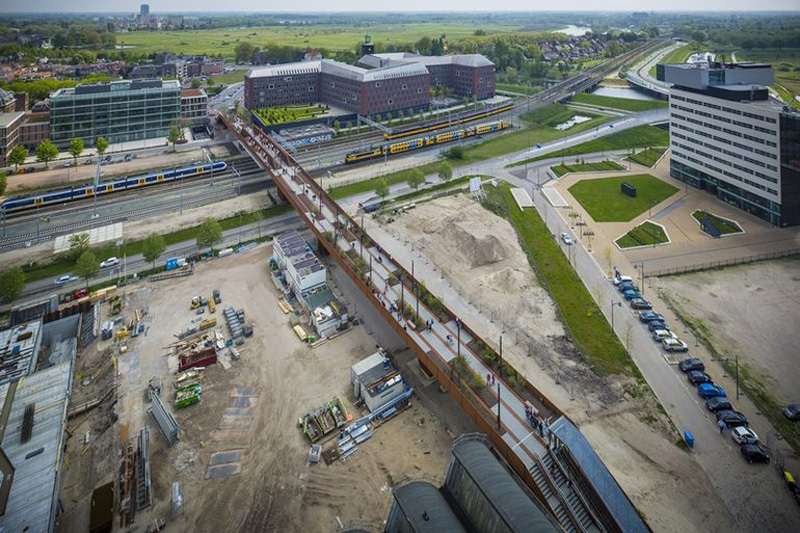 The difference between the money being spent on this bridge and the one they want to build in London is, that there is already terrific cycling and pedestrian infrastructure in the Netherlands and therefore they can afford to spend millions on making this pretty high rise park. To waste money spending on something like this in London when there is no decent and safe cycling infrastructure is an insult. Plus this Netherlands bridge is welcoming bikes, whereas I bet if they build the park bridge in London it will only be for pedestrians. In the Netherlands, cyclists are simply pedestrians on bikes and valued. In the UK cyclists are just an inconvenience. Why did it have to be 250m long? It looks like it could have landed a lot earlier? No, that area is still under development and a landing there would not be possible in future. Now it lands right in another park. The whole objective of this bridge was to make an attractive route and that is achieved by connecting nice places. It looks like you took a wrong turn when you cycled to the left of the bridge structure and came face-to-face with that planting box (around 3:15 in the video). Did you have to duck down to get through the structure? Well spotted! Yes, I had to duck down. I didn’t want to be in the way of the pedestrians that’s why I took that route. 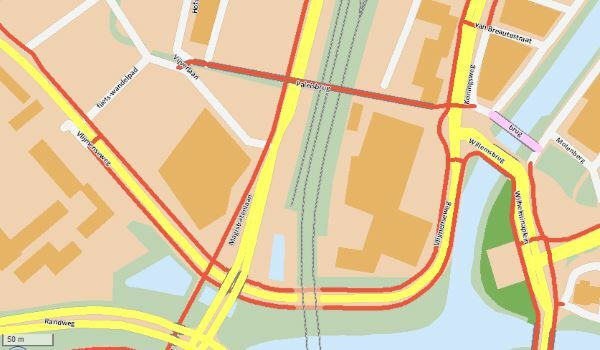 This entry was posted on 16 June 2015 by Bicycle Dutch in Original posts and tagged ’s-Hertogenbosch (Den Bosch), big bridge, exceptional cycling infrastructure.